Kathryn Evans, Elizabeth Wood and Robbie Conti. Kathryn and Robbie organised the event following the fire which totally destroyed Elizabeth's home. Liz Wood and her two sons lost everything in the fire that engulfed their house and the popular bar next door. They have received an outpouring of community support since the blaze, with the people of Lossiemouth and Moray offering them help through money donations and other means. The benefit gig was called the Phoenix Event and was organised by Kathryn Evans and Robbie Conti who wanted to use the power of music to raise some proceeds that would go to Liz and her family to help them rebuild their lives and their new home. 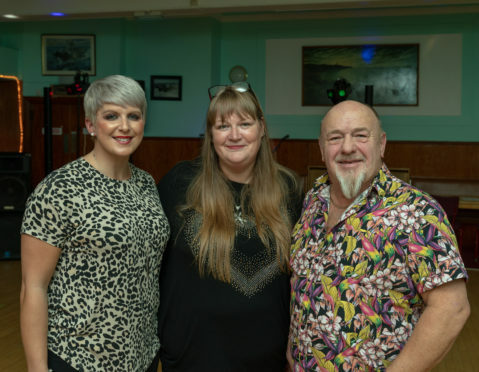 Three bands were on the bill at the Comrades Community and Veterans Social Club in Lossiemouth and they all played electric sets. ACT2, 2FN BADD and Bedhead were the bands who performed and they consisted of local musicians who knew how to get the dancefloor at the Social Club to quickly fill up. A fire service investigation is currently in progress to establish the cause of the blaze that destroyed the bar and home at the end of September. Mrs Wood’s son Luke Wood was the only person in the building when the fire took hold and ripped through the building in the early hours of the morning. He managed to escape uninjured. The family paid tribute to an alert neighbour in the aftermath who raised the alarm to ensure the 20-year-old got out of the house safely. Liz Wood enjoyed the concert and was full of praise for the Lossiemouth community for their support. She said: “It was a really good night, and it was good just get out of the house and away from the humdrum of everything. ”The three different bands were really good and raised £750 which is fantastic.